Habit at Sacred Garden of Maliko, Maui, Hawaii (USA). January 24, 2011. Altitude: Around 1200 metres above sea level. Habitat: It is a species that grows on steep rocks, where it has to endure periods of both dry and rainy weather. Description: Tillandsia australis is a huge saxicolous (clinging on rocks) or occasionally epiphyte monocarpic bromeliad with a spectacular pending spike. This species has long been known as Tillandsia maxima, but this name proved to be invalid as it was already in use for an obscure bromeliad from Central America. Rosette: Star-shaped up to 1,6 metres in diameter. The foliage of the rosette overlaps basally to forms a reservoir (phytotelma), in which rainfall and leaf litter can accumulate, allowing the plant to draw upon their water reservoir during periods of drought. Leaves: Up to 80 cm (or more) long; Sheaths ample, up to 30 cm long, covered on both sides with fine appressed brown scales; Blades ligulate, subrounded and apiculate, 6-12 cm wide, thin-coriaceous, subglabrous. Flower stalk (scape): Stout, erect and then pending. Scape-bracts densely imbricate, foliaceous. Flowers: Suberect. Sepals free, subobtuse, 22-40 mm long, submembranous, strongly nerved, the adaxial carinate. Petals violet. Stamens included. 1) Forest & Kim Starr “Tillandsia australis (Air plant)”. Plants of Hawaii. <http://www.starrenvironmental.com>. Downloaded on 20 August 2014. 3) Wikipedia contributors. "Tillandsia australis." Wikipedia, The Free Encyclopedia. Wikipedia, The Free Encyclopedia, 6 Jul. 2014. Web. 18 Sep. 2014. Cultivation and Propagation: Tillandsia australis is a large bromelid of remarkable ornamental value due to its very informal foliage and the showy long pending inflorescence which lasts for some months. This plant can be grown as both epiphytic, but mainly also as terrestrial, it is very durable and seems to thrive without a great deal of care. Growing substrate: This bromeliad is typically grown in the ground or in containers filled with very aerated, porous, draining, moisture-retentive and rich of organic substance substrata, but it can also been grown epiphytically and roots are covered with moss or coarse crushed tree fern fibre encased in a container or wired to the surfaces of strong boulders, rough bark, rock walls, or tree branches. Exposition: Grow it in bright filtered light both indoors and out. In the garden it grow best where it will get morning sun, but will also grows equally well in direct mid-day sun in hot summer climates. In apartment, it is to be preferably placed in a very luminous position. Low light often diminishes the inflorescence colours. Watering: It enjoys constant moisture from rain or sprinkler and with high local humidity. In summer the plants grow best with high humidity. In dry and hot climate, humidity can be increased with nebulisations utilizing water at room temperature and not calcareous. In summer, some distilled water can be left in the central cavity formed by the rosette of leaves, renewing it frequently to avoid the formation of a mosquito larvae nest, whilst in winter it is better to leave it dry, thus avoiding possible rottenness. Keep humidity up by misting. Requires complete and perfect drainage. If you have one that is not flowering then keep very warm in the spring and water sparingly. 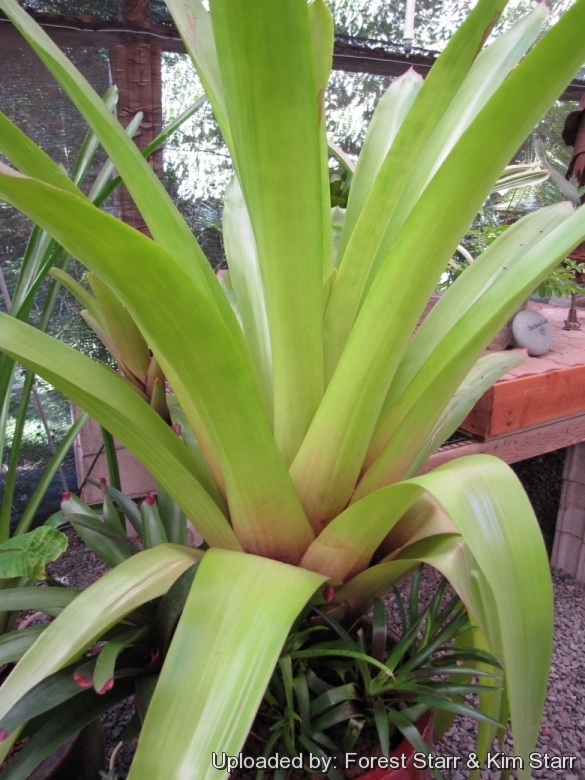 To remove excess salt build-up, leach bromeliad pot once during the summer. Tip: Remove old leaves from plant base and dead ﬂower spikes only. Remove older plant crown when it begins to fade. Use: The plant can be cultivated as a house plant or patio container filler. Propagation: Division. When the flower fades, pups appear from axillary gemmae between the leaves near the base of the plants. The offsets can be detached and repotted when they have reached the dimension of one third of the mother plant. Be sure to provide high humidity for a month after propagating the offsets. It may also be grown from seed: remove seeds from inﬂorescence and lay them uncovered on a bed of crushed tree fern fibres; keep constantly but moderately moist. Starting from the seed, 5-6 years are needed for the blossoming, whilst at least 3 years are needed by division.